Three days over 50 degrees. Has Spring finally sprung here? All that energy coiled through a long winter starting to burst forth. Like the garlic that overwintered in our garden - like this Zentangle. WOW... I AM JEALOUS! I am going to be practicing all day now Maria... I think Spring is coming here to Fla too... it's 48 this morning... and warming to 80 by end of week. AGAIN.. WOWOW!!! Lovely... Your mind is filled with imagination. Any tips would be appreciated!!! Maria, thanks.. your works are so inspiring. I find when I am doing them that I must be OCD or something because nothing ever looks right and I end up throwing much away... like I was telling the other girls, I feel like a child drew it when I look at it... and everyone makes such perfect tangles ... I suppose it's just taking more time to practice. I do have many tangle examples and get all your newsletters, as well as the tons of blogs out there on the subject and books now too, but I just can't seem to find my 'ah' moment when it all comes together. I love the 'growth' and bursting images.. that must have some kind of meaning... Rick would probably be able to figure that out :) Spiritually speaking, it must mean that you are getting to a new level. :) Your work is awesome! Wowza! But once again, I ask the question: what do you do for the shading? Do you use a light wash? revbyrd, shading is with a soft lead pencil and, as rose said, smudged with your finger. Nothing fancy - we use the small "golf" pencils that we include in our kit. We keep a jar of those pencils and various pigma pens on our kitchen table. I'm new to zentangling, I recently found your site on the web. I am now addicited. Thank you!! :)♥♥♥ It is the first form of art that I can just do and not analyze and correct and drive myself mad trying to perfect. It always turns out beautifully unique. It has turned into my favorite form of meditation and is a great form of relaxation. It moves me out of my head and into my heart. Thanks for sharing your talents and moving so many people. So will you be giving a class to become a CZT in Ontario? This is absolutely gorgeous! 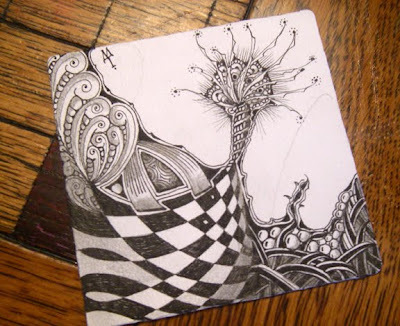 Whenever I see one of your zentangles, I immediately want to grab paper and pen, and zen! Rose, don't sweat your tangles, and don't try to copy anyone else's style. Let it flow, and you'll learn your own strengths. Inspiration is what it takes to create so many individually, unique, and fun zentangles! Keep them coming. I love the way you burst forth Maria. Autumn is just starting here, it is a lovely time of year especially after a hot summer. The air is beautiful and crisp in the mornings. I am fascinated by orientation. Is it best not to have an up or down? Shelly - There is a lot of benefit in not having an up or down. We also encourage folks to turn their tile whichever way feels comfortable while creating a Zentangle. Taking the classes to become a CZT, is this really intensive and does it entail a lot of copying and practice or is it mostly just a hands on workshop where after you're done you are certified? I notice a huge difference in the way Zentangles look comparing the CZT's to the non-CZT people. Is there something I'm missing? I guess I just wish there were classes here in Jacksonville, FL. I can't afford to go anywhere far away at this point. :) Have a great day! Rose, take a look at some of our archived newsletters on our website (under "What's New"). Read ones that discuss our CZT seminars - that will give you a good idea of what it's about. You can also contact any CZT on our teachers list (under "Learn") - they're all there.